Most golfers know that they may take relief without penalty from ground under repair (GUR), but do they always know what constitutes ground under repair and what does not? Ground under repair is any part of the course so marked by order of the Committee, usually defined by stakes and/or lines. When ground under repair is defined by stakes the margin is an imaginary line between the outside points of the stakes at ground level; when defined by a line on the ground, the line itself is in the ground under repair. Ground under repair is an abnormal ground condition, which are covered by Rule 25-1. So far, so good. We all recognise GUR when a white circle has been drawn around course damage, perhaps with a sign stuck in the middle, but in which of the following situation may a player take relief from GUR? h) … just touching a white line defining GUR. e) Relief is available. Definition of Ground Under Repair. Trees and other growing things rooted within the ground under repair are part of the ground under repair. Decision 25-1a/1. How did you do? All of the above questions and answers are covered in my eBook, “999 Updated Questions on the Rules of Golf 2012-2015”. Details can be found at this link. Here is one final point to remember regarding GUR. Rule 25-1b states that a player may take relief from interference by an abnormal ground condition; they do not have to if they consider that the lie that they may have after taking relief could be less favourable. However, many Committees, with the intention of protecting damaged areas of the course, will introduce a Local Rule making it mandatory to take relief; so always check first. Hi Barry,this a question really not a comment but related to GUR and specifically the definition of abnormal Ground condition and the words 'Cast or runway of a burrowing animal'. Simple question really what is meant by a 'cast' and are Rabbit droppings 'cast'? I believe not, but a incident occurred at my club recently where a players ball landed in bare, dry earth, but with rabbit droppings near the ball. No signs of any scrapes or any indentations caused by burrowing, hence my ruling was NO RELIEF. Was I correct. A mole hill is an example of a cast made by a burrowing animal. Droppings/dung are loose impediments and nothing to do with casts. You were correct in ruling that there is no relief from bare,dry earth just because there are rabbit droppings nearby. In my opinion, sand that is still in a pile, large or small, that is intended to be lifted for scattering on the course meets the Definition of material piled for removal, but the residue of sand left after the last pile has been removed does not. I am aware of the rule stating that relief is available in instances where a ball lies outside of an area marked as GUR but in a position where overhanging branches of a tree rooted in GUR interferes with the intended area of swing. However I am not clear about whether it makes any difference if the overhanging branch at the exact point where it affects the swing is inside or outside of a vertical point directly above the line marking the GUR? I ask this because I also read in the definition that the margin of the GUR extends vertically downward but not upward??? If any part of a tree that is rooted inside the margin of GUR interferes with the player's intended area of swing they may take relief even though their stance is several feet outside of the margin. Thanks Barry, but what would be an instance where the rules stating that the margin of the GUR does not extend vertically upwards be applied? It is because the margin of GUR does not extend upwards that the player may take relief, without penalty, when their ball lies in a position outside of GUR where there is interference from a growing thing rooted within the margin of GUR. Is there a rule or decision that prohibits players to enter an area that is defined as GUR? Second question, is there a limit on the amount of time an area can be defined as GUR? I ask this because we have an issue on our course with an environmental area. This area was not defined by an official department so marking it as an ESA would be a breach of the rules. Now we are trying to find a way , within the rules, to make it clear to players that they can't play or even enter this area. Do you have a suggestion? 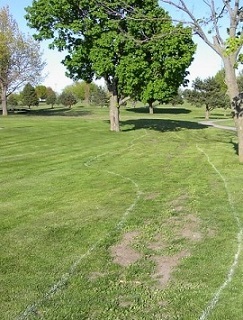 There is no Rule of Golf that prohibits a player from entering GUR (an abnormal ground condition), but it is possible that a Committee may have established a Local Rule with such a restriction. This is quite common to protect ESAs (environmentally sensitive areas). I believe that you posted a follow-up question asking for an instance of a Rule stating that the margin of the GUR does not extend vertically downwards, but I seem to have deleted it in error. Q. A player's ball comes to rest against a tree root. The tree is within ground under repair, but the ball is against a part of the root outside the ground under repair. Is the player entitled to relief without penalty under Rule 25-1? A. No. The margin of ground under repair extends vertically downwards, so part of a growing thing within ground under repair that extends beyond the area at or below ground level is not ground under repair. A ball comes to rest 10ft from the hole on the putting green. In the line of the golfer's putt is a two foot wide wet, muddy patch that has been caused by water damage. Is the golfer entitled to lift and place the ball without penalty at the nearest point of relief (i.e. right or left of the muddy patch), but not nearer the hole and not in a hazard? There is no relief from this muddy patch on the putting green, unless it has been defined as ground under repair by the Committee. In the circumstances you describe it seems that the Committee would be justified in declaring the area ground under repair immediately, though it is preferable that all areas which warrant marking as ground under repair should be so marked before the start of a competition (Decision 33-2a/2). Hi Barry! Today my golf ball stopped leaning on a broken dry branch in the middle of the fairway. In this case, how should I proceed? I was reading R&A golf rules and found item 24-1 - Movable Obstruction. Is this the correct rule? Thank you! A detached branch is a loose impediment (natural object) and not a movable obstruction (artificial object). You may move any loose impediment, but if your ball moves while you are doing so, you incur a penalty of one stroke (Rule 18-2a) and must replace the ball. Crows pick out the chafer grubs on our greens, some damage is extensive, greens staff repair the damage with sand infill. Treated areas, although rain and wind my gave blown the infill away - Should not be considered as AGC. Thanks for the good insight your blog gives on the rules. The Rules of Golf do not permit taking relief from damage to putting greens made by birds. I recommend that your Committee checks with your National Golfing Body to see whether they would permit a Local Rule. If I had to guess, I do not think that such a Local Rule would be permitted, as crows are present on many courses and I have never come accross this before. Yes, a player must take full relief when taking relief without penalty from GUR. See my blog dated 2nd March 2011. The penalty is two strokes in stroke play, loss of hole in match play. What is the rule if you play from GUR in error? Should you go back and take a drop, or continue and take a penalty? A line on the ground by a ditch I thought was OOB so I played my shot. As I moved to take the next shot towards the green I noticed it was actually a bigger area marked GUR. I went back and took a drop outside the GUR and played onwards without penalty. Should I have continued with the original ball and had a 2 shot penalty added or was I ok to go back and to a free drop? Or should I now add 2 shots to my score for the error? What did the Local Rule say? The Rules of Golf permit a player to play their stroke from areas of GUR. However, many Committees make it mandatory to take relief from GUR with a penalty of two strokes in stroke play for failing to do so. If there was no Local Rule your first ball was in play when you played it from GUR,so you incurred a penalty of one stroke for picking it up (Rule 18-2), which increased to two strokes when you did not replace it and subsequently played it from a wrong place (Rule 20-7). It is unlikely that a Committee would disqualify you for a serious breach in this circumstance. If there was a Local Rule you incurred a penalty of two strokes for breaching it, but then proceeded correctly. So, in either case two penalty strokes were incurred. Three questions. I'll be brief. 1. Is a washout not clearly marked (such as around a tree on a hill with no pinestraw around it), considered ground under repair? I was informed that only if my feet touched the protruding underground netting could I take relief. 2. My ball came to rest six inches deep in the top of a rotted out creosote timber surrounding a water hazard. Free drop, or unplayable? 3. My friend called a large four foot round, one foot deep depression in the woods (non red staked) a free drop, because he deemed it either a burrowing animal had caved in the ground years ago, or a tree fell and the root system made the depression and they must have removed the tree years ago. I contested and he played it with a free drop anyway and won the day by one stroke. It was clearly just part of the undulation of the floor in the woods. Should he have a two stroke penalty? 1. There is no ground under repair on any course unless the Committee has intoduced a temporary Local Rule desribing the area(s) as such. The advice that you received appears to be correct. If protruding underground netting interfered with your lie, stance or area of intended swing you may take relief from it, because it is an immovable obstruction. 2. If the timber surrounding the water hazard was inside the margin (which is likely) there is no relief from it without penalty. If it is outside the water hazard (check the Local Rules if it is not obvious from the hazard stakes or lines) then relief without penalty may be taken as in Rule 24-2. 3. Undulations are common on most courses and there is no relief from them unless they have been declared as ground under repair. It seems obvious that the one that you describe was not a hole made by a burrowing animal or material piled for removal. The player certainly incurred a penalty of two strokes for lifting their ball and playing from a wrong place (Rule 20-7). I hope that you did not sign their score card, as it was your duty to report the breach on behalf of all the other competitors! Too many players make the Rules up to suit themselves. If a ball lies in a position where relief can be claimed from two options, i.e. it is sitting on a cart path and in casual water, can the player choose which avenue of relief to claim? Yes, but if the nearest point of relief to the casual water is on the cart path the ball must be dropped within one club-length of that point, not nearer the hole, and vice versa. I hit a ball into a pile of green corings left on fairway by staff. The ball just rolled off the corings. The ball was in a position where my stance or swing was not affected but had I played a shot forwards, the ball would have hit the corings. Any relief (I thought not but my partners thought yes). If the green corings were piled for removal they are Grounf Under Repair (GUR). However, there is no line of play relief from GUR, so in the circumstance that you describe, where the corings did not affect your stance or swing, you were not permitted to drop away from them. You were permitted to remove the corings in front of your ball, as they are also loose impediments. Hi Barry, My question is regarding GUR on the green, we have a situation at our club regarding excavation of drainage on our 16th green, where if you are on the right side front of the green and the pin is at the back, there is no way too avoid the GUR, which brings us to wonder if we are employing the correct rule to this situation, which is rule 25 (iii), in my opinion the nearest point of relief is off the green, however the question about maximum relief as mentioned in the rule, brings in the question, can I take maximum relief, and drop the ball at a point on the green along to the left of the green to avoid the GUR, is this correct. if you imagine a circle with the pin at 12 oclock, the GUR extends from 3 oclock to almost the centre of the green, and the ball is on the green at about 5 oclock, unable to put to the pin. Kind regards Maldwyn Williams. Coincidentaly, I expect that the subject of immovable obstructions and abnormal ground conditions on the putting green will be the subject of one of my blogs in early January 2017. If the ball is on the putting green the player does get line of play relief to the hole, even if the GUR does not interfere with the lie or stance for their intended stroke. The nearest point of relief may not be on the putting green. However, if the ball lies off the putting green there is no line of play relief to the hole, the player must chip through or over the GUR. If the Committee feels that this is not practical or feasible, they may introduce a dropping zone option while the green is being repaired. is where there is casual water on the putting green that completely surrounds the hole. So You Are Going to Play Match Play!